The zoo came to existence because its founder, Charles Paddock, turned his love for nursing hurt/sick animals to health and setting them free into housing the healthy animals after he rescued them. 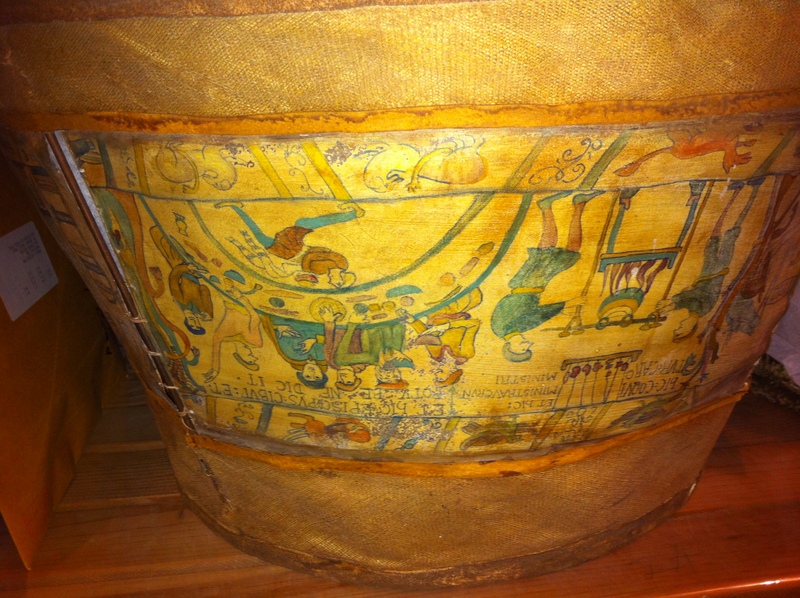 Before taking its founder’s name, the zoo was known as Atascadero Children’s Zoo. Right now, a renovation is taking place to make more naturalistic habitats for the animals. The Malayan Tiger can be found on the Malay Peninsula and the southern tip of Thailand. Charles Paddock Zoo allows visitors who come frequently to become members. Members of the zoo get in free for a whole year and get special perks such as discounts on birthday parties or other events and discounts on gift shop items. Helen Thompson, who was visiting the zoo when I was, told me she had been a member for the last three years. Helen Thompson helped her grandson, Anthony, read the information about the Malayan Tiger. The screeching squawks and caws led me to the bird cage next, where I found blue and gold macaws and parrots. Nearby was the flamingo cage. The Black-handed spider monkey- used their tails just like their hands when climbing around their cage! The Gila monster-has black, yellow, orange, and pink scales! The Fossa- looks like a mix between a hyena and a mountain lion! 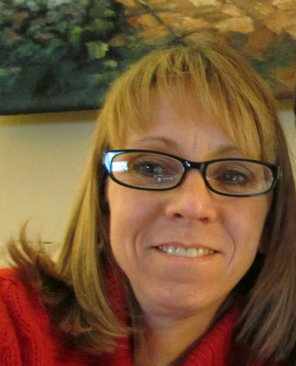 Jennifer McVey, another visitor of the zoo said she came to Charles Paddock for a pick-me-up after a rough day. Jenny McVey tried to share her granola bar with the monkeys. They did not accept. Some cages I enjoyed most were those of the Aldabra tortoises and the meerkats. The tortoises were enormous and so still that I thought they were large rocks until they peeked their heads out, and the meerkats stood up straight and alert, quickly twisting their tiny heads at any bit of sound. With cheap prices and large array of animals, Charles Paddock Zoo is the perfect place to spend a day. It is located within Atascadero Lake Park, which is full of tables for a picnic after a visit at the zoo. Whether it be the beaches, the weather, the scenery, or the hiking, San Luis Obispo County visitors and residents always find something to rave about. A few locals and vacationers shared their opinion of SLO County with me. In San Luis Obispo, you will never struggle to find delicious, healthy produce. Along with the fresh fruits and vegetables available to purchase at the weekly farmer’s market, Cal Poly grows produce on campus for students and the community to pick for themselves at the Cal Poly Orchards. 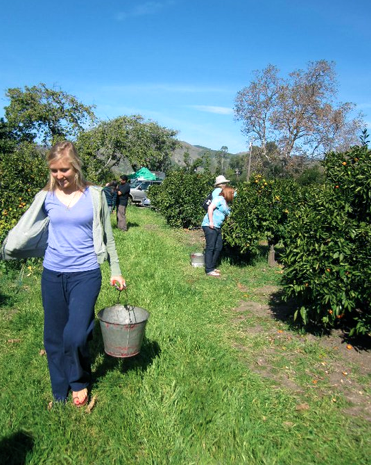 Located on the south side of Highland Drive when exiting from Highway 1, the Cal Poly Orchards are a popular place for students and other San Luis Obispo residents to spend a day in the sun gathering fruit. The season for picking stretches from April to October, and the orchards are open from 1 pm to 4:30 pm on Wednesdays and 10 am to 1 pm on Saturdays. The only exception is when it rains, picking is cancelled. Currently, during the month of February, mandarin oranges and persimmons are in season. Rachel White, a freshman agriculture major at Cal Poly, said she knows that during this season there are many other fruits and nuts available for purchase. Mandarin oranges are native to southeast Asia and the Philippines. Persimmons grow on a species of ebony. 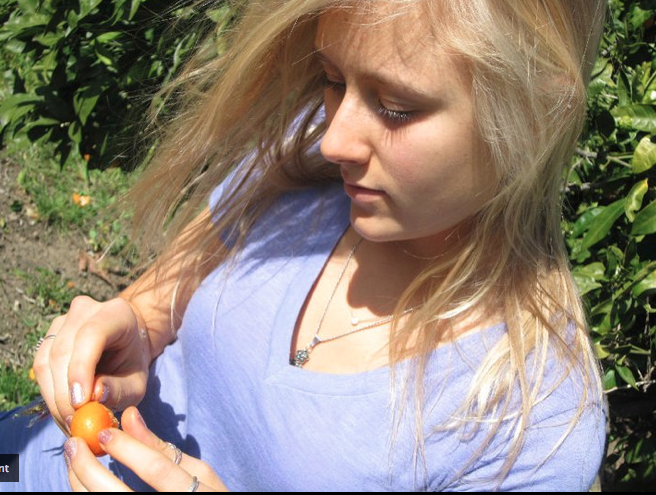 Julia Purvis, a freshman psychology major at Cal Poly has been to the Cal Poly Orchards several times. This time, she was with her grandmother, Charlotte Purvis. Julia and her grandmother are originally from Arizona, where they claimed to make the best guacamole. The came to the orchards to pick avocados to make some of their special guac. Julia and her grandmother (located in the far back right of the photo) planned to cook dinner for Julia’s grandpa, William, after they picked their avocados. 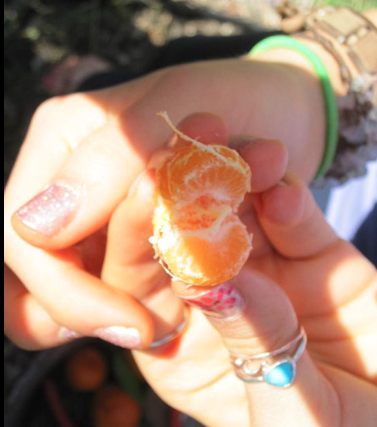 Julia said that of the produce she has picked at the orchards, the mandarin oranges have so far been her favorite. One more benefit: Going to the orchard is a cheap way to enjoy some fresh air on a sunny day. Produce is sold for just a dollar a pound. Julia was hesitant to try a persimmon at first, and picked mostly oranges. Her grandmother finally convinced her to try one, and she loved it! 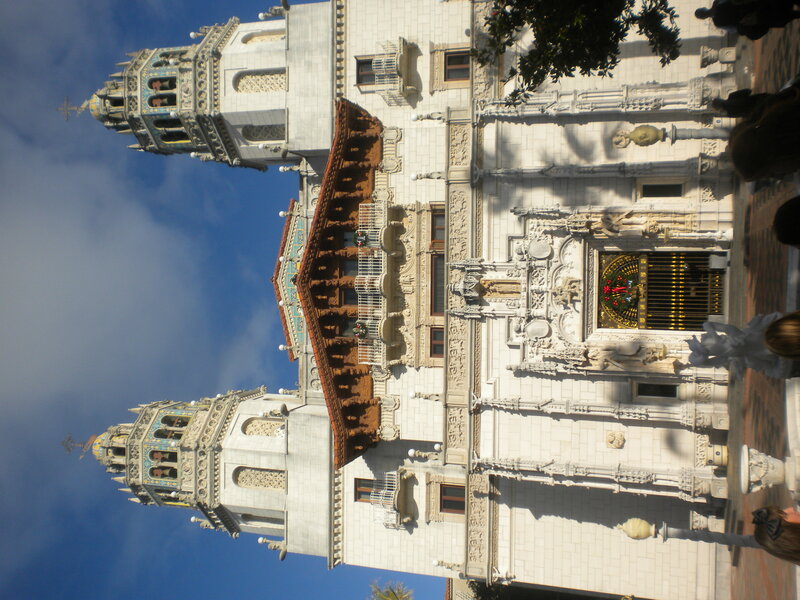 Located just 43 miles north of San Luis Obispo is Hearst Castle. 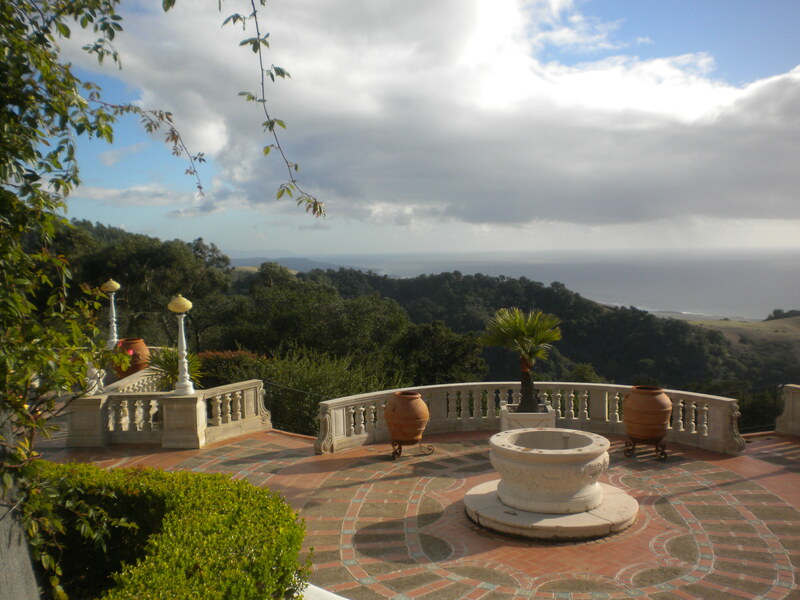 This castle was designed by William Randolph Hearst and San Francisco architect Julia Morgan and completed in 1947. Tours began in 1952 and the castle continues to be shown to this day. 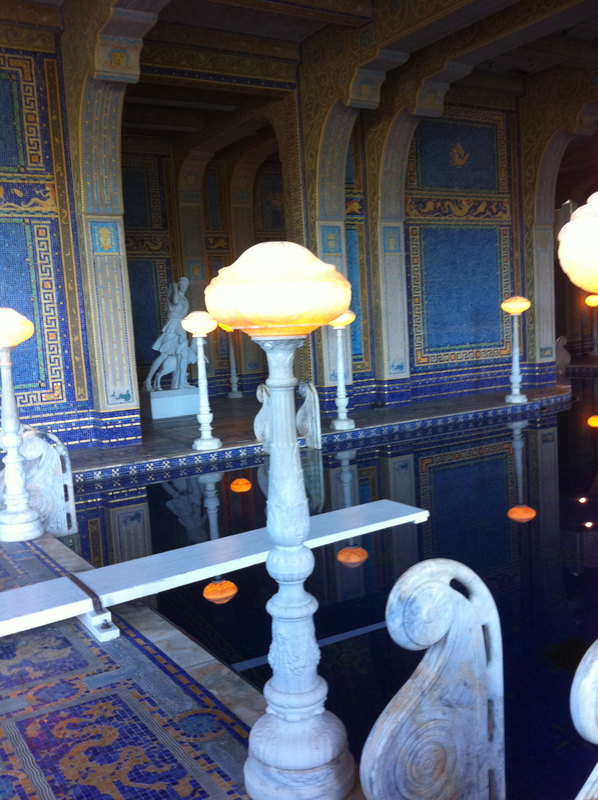 Hearst Castle has 165 rooms and 127 acres of gardens and pools. Dan Eller, a professor at Cal Poly, was able to take Cal Poly’s Public Relations Student Society of America on a tour of Hearst Castle, because he does PR for the castle. He told students in our club all about the different tour options, showed us around the castle, and even took us behind the scenes to see where important objects that needed repair or needed to be kept safe were stored. This pot was chipped and currently is being kept in the basement for safekeeping. Professor Eller told us that the Roman pool, shown in all five tours, has 1" mosaic tiles decorating the room from ceiling to floor. 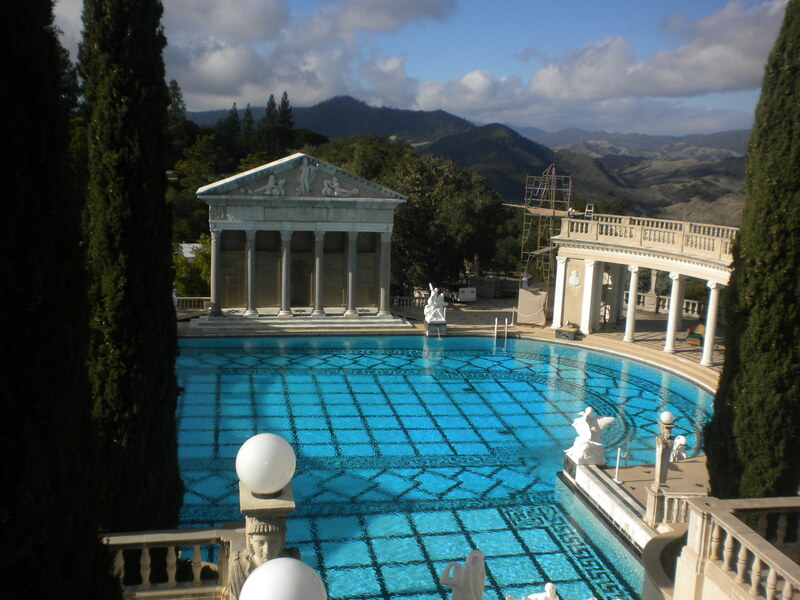 On tour 2, you will be sure to see the Neptune Pool, an outdoor pool that holds 345,000 gallons of water! What do you see: The north wing of the main house (“Casa Grande”) and the guest houses. 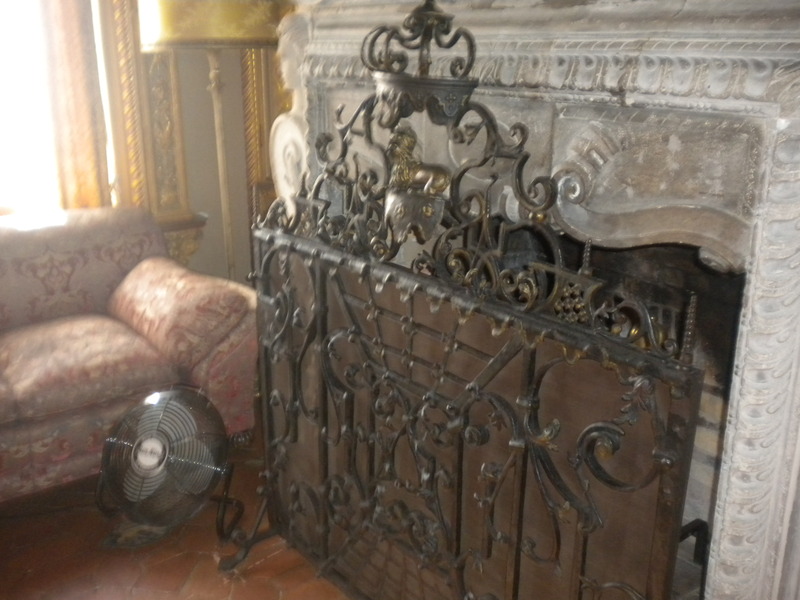 Tour 3 spends much time in the "Casa del Monte" which was on of the castle's guest houses. This is one of the 10 bedrooms in the guesthouse. While tour 4 focuses mainly on the gardens and patios, tourists also get to see Hearst's wine cellar. 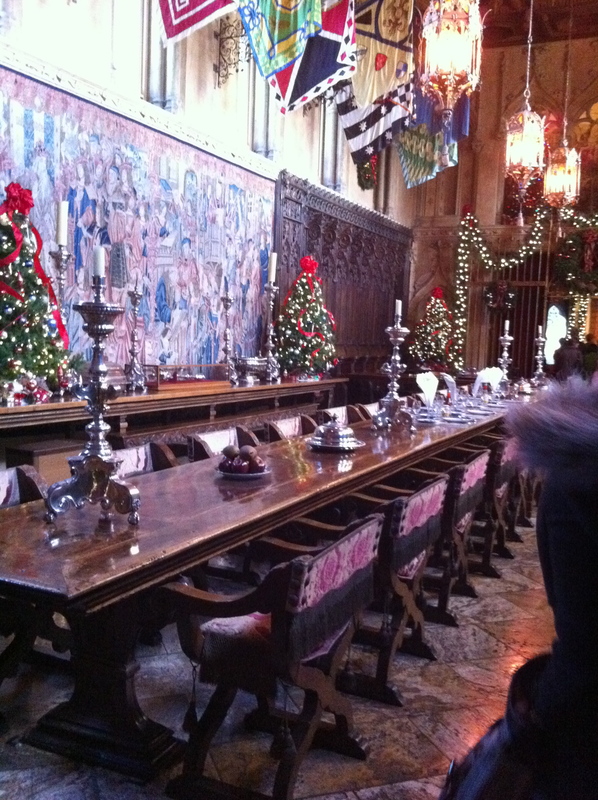 All of Hearst's guests would meet for dinner each night of their stay in this dining hall. Hearst would sit in the middle and seat those he deemed most important closest to him. For those who have never seen the castle, Tour 1 is a good choice. The dining room is shown, along with both pools and many rooms in the main house. A fourth year Cal Poly journalism student, Rachel Egan, said that her favorite room was the dining hall. Since I’ve moved to San Luis Obispo, I have spent many weekends at Avila Beach. My favorite spot for lunch, I have decided, is an oceanfront site called Hula Hut. While Hula Hut’s main seller is their Doc Burnstein’s ice cream, they also sell coffee, sandwiches, salads, waffles, homemade fudge, and more. Recently, I went to Hula Hut to interview an employee with an audio recorder; it was my first attempt to record a sound profile. What to do– Make sure to collect 20 seconds to a minute of ambient sound. Play it back to find out exactly what kind of background noise you are dealing with. If ambient noise is too loud, it can drown out your speaker. My experience- I recorded ambient noise right outside of Hula Hut. There are tables outside and I planned to hold my interview there. I assumed the ambient noise would be waves, but it turned out cars were constantly driving past loudly, so I held the interview inside. The ambient noise in the store was coming from the radio and customers. What to do- Natural sound should be a sound that is descriptive of where you are at, but is not constant. For example, if you were interviewing someone about music, a guitar being tuned would be a natural sound. My experience- I recorded the sound of the register opening and a receipt printing. While this happens often during the day, it is not a constant sound. What to do- Make people feel like they are there, rather that just hearing about it. Create an image in the minds of your listeners. 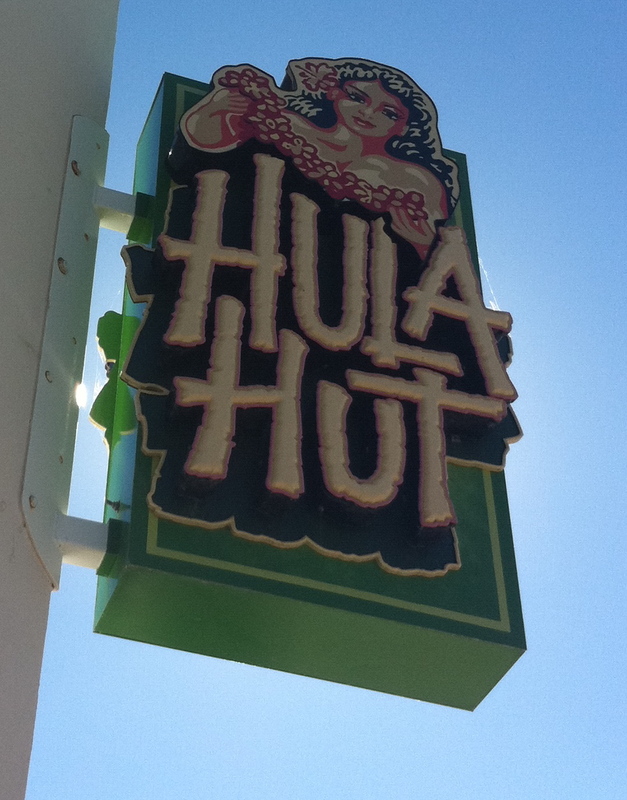 My experience– I interviewed Sharon St. Peter, an employee at Hula Hut. She did a good job of describing the basics of Hula Hut, such as the hours, the food, and the customers they serve. However, she could not think of any funny anecdotes from working there, which may have made the story more interesting. She did however share that many locals come to Hula Hut each day. Sharon St. Peter said that motor oil was the best selling Doc Burstein's ice cream flavor. I also interviewed Shawn Little and James Robbins, both 24-year-olds from Pismo beach, who were eating together in Hula Hut. Shawn had ordered the Turkey Gourmet sandwich and John had ordered the Clam chowder. Both said they enjoyed the meals and were returning customers. Sharon, Shawn, and James discuss the Hula Hut.